Adventures in the Endless Pursuit of Entertainment: Calling All Hitchcock Fans! 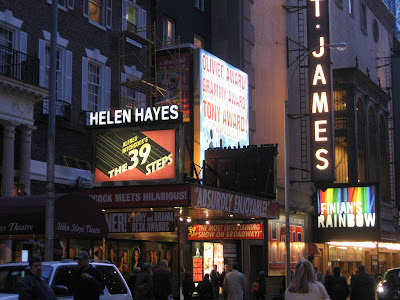 Before a bird lands or a plane dives near, all self-respecting Alfred Hitchcock fans should get themselves over to see to see The 39 Steps at the the Helen Hays Theatre on 44th Street. It's a wonderful, clever spoof of the 1935 film of the same name. I recently watched the film again - an exciting mystery chocked full of romance, noir and unintentional hilarity. Hitchcock makes one of his early cameos - and look for him in the stage production too. I saw it when it was still at the Cort Theatre last year, but jumped at the chance to go again as a guest of the producers, along with my buddies Theatre Aficionado Kevin and Byrne of Stagebuzz.com. It's even better at the jewel box Helen Hays Theatre. The cast of four is fantastic - somehow, together they play 150 different characters. You've got to see it to believe it. Before you go, check out the official website, www.39stepsonbroadway.com for all kinds of fun enhancing activities. There's also a talkback on Tuesday nights after the show - we were privy to moderation by Stone and Stone. But act fast, because the fun ends on January 10, 2010. Go with a discount from Broadwaybox.com! The 39 Steps is coming to the Majestic Theatre in San Antonio in February. I can't wait. "He was THE MAN WHO KNEW TOO MUCH!" I'm thrilled you had a good time. To me it's the essence of theatre, four actors and a few props and lots of imagination. And I'm glad I had a chance to see it in July at the Helen Hayes, such a cute little building!